Dakenag can provide you with a guaranteed high-performance solar cell or high-performance solar system to meet your requirements for farm, home or recreation. 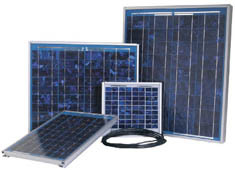 Panels available from 2W to 100W. A: Power Probe II. Fault finding made easy, saving you time and money! Read fence voltage, fence current and the direction of a fault. Now with added safety with no cords, waterproofing and a belt clip. B: DAKENAG Analogue Voltmeter. Simple to use and read. Reads to 10,000V. 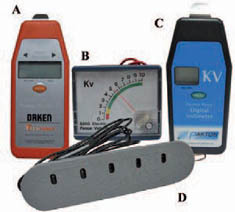 C: DAKENAG Digital Voltmeter. Now cordless like the Power Probe II. Reads to 9900V. D: Dare 5-0-Lite. Lights flash to indicate fence voltage. Also available is the Dare Single Lite Tester. A: AC Adaptor.Your BT2, BT6 or BT12 can be powered from your mains power. B: Battery Charger. 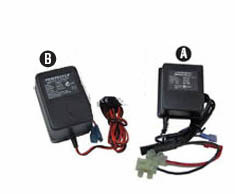 Fully automatic battery charge to suit 12 Volt, 7amp, get type rechargeable battery.